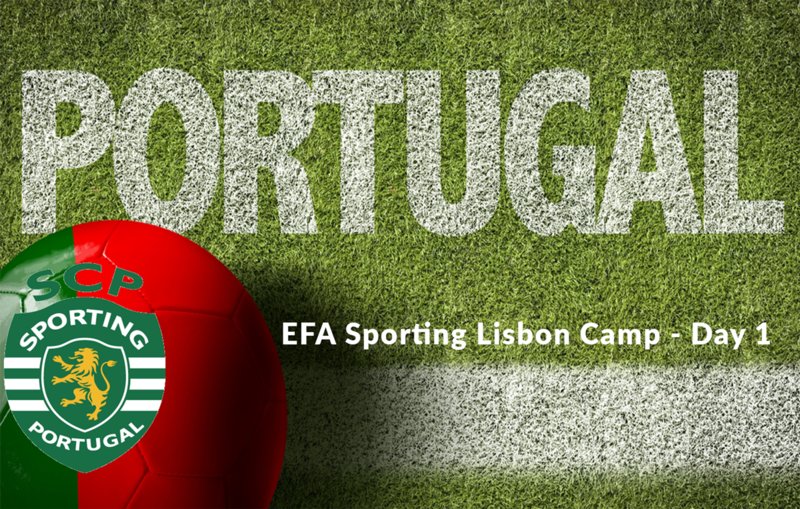 Welcome to our Sporting Clube Portugal Camp blog for 2018. The day started early for the EFA players who were pumped up and excited about their one week adventure. For some of the players the week was a chance to learn from the Sporting Coaches and have a lot of fun in the Portugal sun at Sporting Clube Portugals Youth Academy with their teammates. For others who were individually selected by our coaching staff for the EFA Internship, it was their chance to show Sporting Coaches what they had. Meeting at Heathrow for 6am start was a bit of shock for some, bleary eyed, headphones on and belted in their seats the flight over to sunny Lisbon was soon over and welcome change to the cold wet weather of London. On the Buses and the players and coaching staff made their way to Sporting Clube Portugals training grounds. For some this was their first trip and a chance to be shown around what one of the worlds top Academy’s looks like, for others it was a chance to show new friends all the little things that make the academy a great place to be. Changed and ready for the day, the players hit the canteen for a healthy lunch and a chance to fuel for the coming days. Afternoon gave the players a chance to settle in and unpack before heading out to their first coaching session of the week. A few of the internship players headed with the Director of the EFA Coach Nuno in to the university pitches for the start of they internship training that involves training with and playing for the Sporting Academy team in their age group. Luckily the weather was a perfect temperature for training, the Sporting coaches while making the sessions fun also demand a certain standard from the players across all elements of the session. After a quick shower and a moment to rest after training, the players headed in for dinner. For the uninitiated Portuguese dinner includes a soup!, while bit of a shock for some, and a bit of a rebellion from some, dinner was finished up and the boys exhausted from the long day were able to get back to their dorm rooms for the big day tomorrow.